The theme of the 6th Tallinn Applied Art Triennial “The Art of Collecting” was developed by Love Jönsson (Sweden), whose dedication to modern applied art and design, as well as his work as a curator, critic, lecturer and historian on the international scene is remarkable. The decision to invite a curator from outside of Estonia was inspired by the wish to add an international dimension to the event and to broaden the local and general understandings of the possibilities of interpreting applied art and design. Geographically unrestricted open competition attracted 515 artists from 43 countries. A jury of five selected 70 artists from among them and later invited five more to participate. In addition to the main exhibition three satellite exhibitions took place “70 Cotton Smocks”, “The Art of Collecting. The Art of Sharing” and “Corpus Container”, international seminar and artists’ presentations day were held. The catalogue covering the Triennal’s main exhibition and all the other events of the Triennial was published. In 2009, the Tallinn Applied Art Triennial took place as an international event for the fifth time. To find a theme and curator for the triennial, the society’s management held an invitational competition; the young designer and artist Kärt Maran was selected as the winner with a project called “Know How”. The exhibition poses provocative questions: What is the essence and objective of applied art? Are works born of jealously guarded know-how and artistic egocentrism the only creative path? “Know How” is an experiment that sets out to prove that good design and applied art are founded on ideas, not on keeping secret the method and skill for executing the design – in its own way, it is thus a reaffirmation of the social nature of applied art. This year’s triennial followed the competition exhibition format of years past. Applications were received from 142 artists – a total of 176 works from 28 countries. A five-member jury selected the works of 38 artists to be displayed at the triennial exhibition. 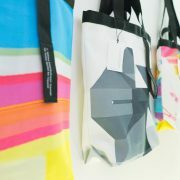 In addition to the main exhibition two satellite exhibitions took place “Estonian Academy of Arts Know How. Isn’t it so simple?” and “Practical Kunst ja kodu”, international seminar and artists’ presentations day were held. 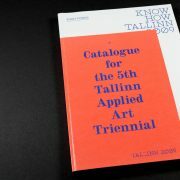 The catalogue covering the Triennal’s main exhibition and all the other events of the Triennial was published. 2006 was the fourth time that the Tallinn Applied Art Triennial is an international event. Having developed from the applied art triennials of the Baltic states taking place in Tallinn since 1979, this art event today remains the only art forum in Europe that includes all fields of applied art and design without any geographical limitations. Notable interest in the triennial among the artists even in the three interim years has strengthened the organisers’ confidence in the need for such a series of art events. In 2003, the exhibition bucked the customary format by means of an exhibition based on the selections made by the award-winning artists from the 2000 triennial and a seminar that offered a retrospective and discussed the relationship of applied art and design during the previous triennials in Estonia. This time, the triennial allows a broad-based meditation on the roots of applied art and design, i.e., on the earlier traditions. Displaying a photo of the item that served as the source of inspiration next to the exhibited work will make viewing the exhibitions and leafing through the catalogue truly gripping. All in all, there were 332 applications submitted by artists from 27 different countries. The jury of the triennial examined anonymously the entry applications submitted by 291 artists and selected more than 110 works by 92 artists from 15 countries to be displayed in the main exhibition of the triennial. In addition to the main exhibition two satellite exhibitoins took place “Big Science” and “Two Close Ones, Close To Everyday”, international seminar and artists’ presentations day were held. The catalogue covering the Triennal’s main exhibition and all the other events of the Triennial was published. In 2000, the Tallinn Applied Art Triennial was held in the competition exhibition format. The theme was developed by group F.F.F.F. (Kristi Paap, Kaire Rannik, Berit Teeäär, Ketli Tiitsar). The theme was “Possession” which was explained as follows: Even the simplest objects become parts of personal space – they become possessions. Moods, motivations, notions become reality; they materialize in a way they live in makers mind. Meetings create obsessions; a need to possess objects long yearned for. Obtaining such objects provides the owner emotional satisfaction, it gives an environment that is replete – embryonic. The triennial received applications of 257 artists from 25 countries. The international jury selected 74 participants, all together from 19 different countries. The catalogue covering the Triennial’s exhibition was published. First Tallinn Applied Art Triennial took place in 1997. The theme of the exhibition was “Useless Things”, it concentrated on the phenomenon of interfusion of aesthetic and conceptual pursuits in contemporary applied art, a process that has made the relations between traditional notions and concepts indistinct and meaningless. From among 304 applicants form 26 countries, the international jury chose 79 artists of 16 different nationalities. The triennial was accompanied by a catalogue.